When you correlate everything, you see the patterns. Sure, at Waterloo, the French used CANNONS while the British used CANISTERS. On the day of the battle, it rained a lot. The ground was very muddy, soft and wet mud. In that weather and ground conditions, cannons were not as effective. It was more than just the weapons. In those weather conditions, Napoleon delayed and that cost him the battle. But had the weather been dry, things may have been different. The cold clearly beat Napoleon on his attempted invasion of Russia. There is also the Human Excitability Study where war was correlated to sunspot activity. The sunspot cycle is roughly every eleven years. However, this time it’s different. The sun is headed for a very rare, super-cooling period that threatens to topple civilization itself as it has throughout history roughly following a 300-year cycle. 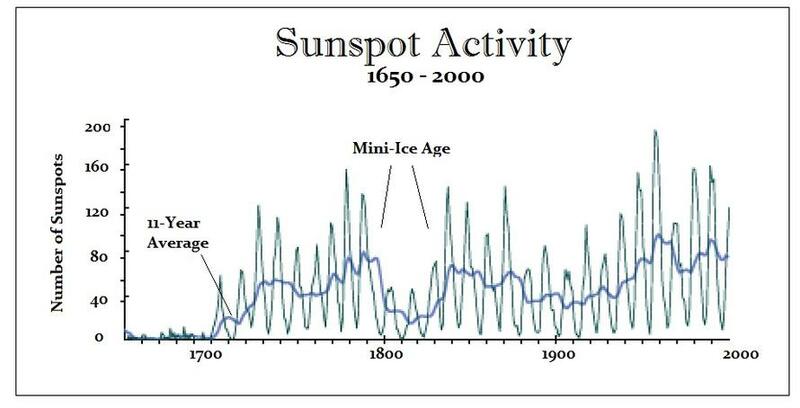 The last Maunder Minimum, during which the sun languished for seventy years, took place from 1645 to 1715 when the sun’s brightness declined and the number of sunspots collapsed to almost zero. We are seeing almost zero so far in 2018. The title is a bit of a long-winded oddity suggesting that human nature becomes more excited during the increased periods of sunspot activity. Whether or not Tchijevsky proved his theory that we are all driven by sunspots, much in the same manner as the moon drives the tides of the seas is another subject which I am not too certain about. 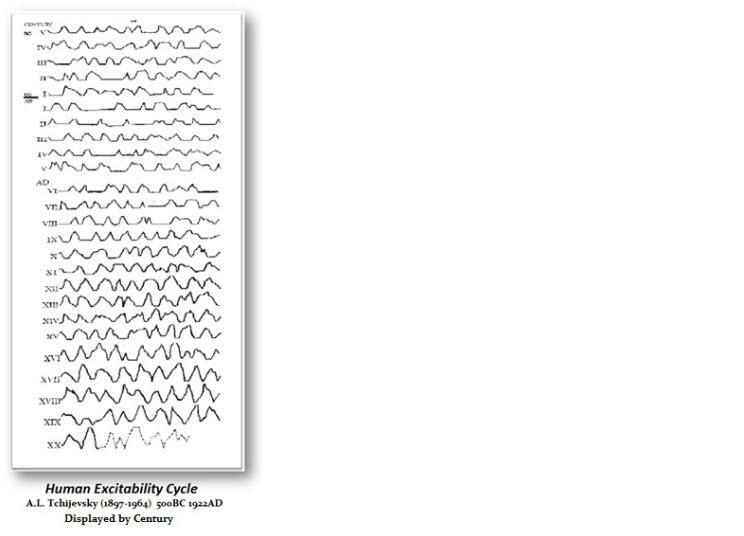 Tchijevsky’s work is an interesting collection of knowledge that does illustrate a pattern within human activity. Tchijevsky did prove that man became more excited every 11 years which did correspond to the known 11-year cycle of sunspot activity. He gathered data from 72 nations from 500 B.C. to 1922. Throughout the 2,422 years, he included such factors of human excitability as war, riots, revolutions, expeditions, and migrations. He took into consideration the magnitude of the event, the size of the area affected, and the number of people involved. The charts that are reproduced here give a very interesting cyclical view of man’s activity which you can call emotion or excitability. The Tchijevsky cycle clearly indicates that every 11 year cycle period can be broken down into four distinct periods. Period #1 has a duration of three years which is marked by peace, passiveness, and general rule by minorities. Period #2 has a duration of two years in which general excitability grows from political unrest. New ideas or concepts emerge which tend to challenge the party in controL These ideas become popular answers to present day problems but there is a definite lack of a uniting force. Period #3 again has a duration of three years. Under this period the public’s voice is heard. Under a dictatorship, this has been the strongest period of mass riots and revolutions in which major problems are solved. At times, anarchy does prevail but generally democratic reforms are gained. Period #4 has a duration again of about three years. The general excitability declines, and the people go along contented in a state of apathetic moods. Peace movements usually are generated during this period. The masses prosper and go about their normal course of life awaiting the sun to set and the new light of dawn which brings the beginning of a new cycle. Reflect for a moment about these four distinct periods. Looking at our own recent political history, we see a similarity between this cycle and our preference towards political parties. For example. we had a cycle of peace and passiveness following World War II culminating in the peak of Period #3 during the Johnson term. We entered Period #4 bringing in President Nixon as everyone went about their business. Gradually we entered Period #1 which brought about the Watergate affair resulting in the Ford administration and Period #2 which has a duration of 2 years. Jimmy Carter arrived in town ushering in Period #3 which is the peak on the 11-year cycle that normally contains revolution of political unrest. This brought about Period #4 when we revolted against the Inflationary policies of the Democrats by voting in President Reagan with a sense of returning back to passiveness and old standards and goals. Who knows if these events indeed were caused by sunspot activity? Perhaps the sunspots do affect our emotions in much the same manner as the moon can move the ocean from side to side. But the fact that remains is this: a cycle does exist. You can find no century on this chart that was ever lacking such human excitability. We are indeed “only human” to capture a saying normally invoked for human error. We have all heard that history repeats itself. Perhaps it is not history that repeats so much as human error. We are not immortal. We have not lived constantly throughout time. We die and are replaced by new generations. Each generation tends to believe that they are smarter than the last, failing to accurately study the errors made by previous generations; they will make the same mistakes. Perhaps the events might differ but the result is always the same. Just as the Crusaders charged off to the Middle East to free the holy land from pagan Arabs, as they viewed it, we charged off into Europe to set the world free from the madness of Hitler; both resulted in worldwide wars so the events may have been different but the motives, passions, and outcomes were the same. Tchijevsky’s attempt to relate man’s excitability to sunspot activity did accomplish one thing significant. His life’s work may not have proved or disproved his sunspot theory, however, it did provide us with evidence that man’s excitability, or emotions as I prefer to call it, moves within a cyclical pattern that can be identified.